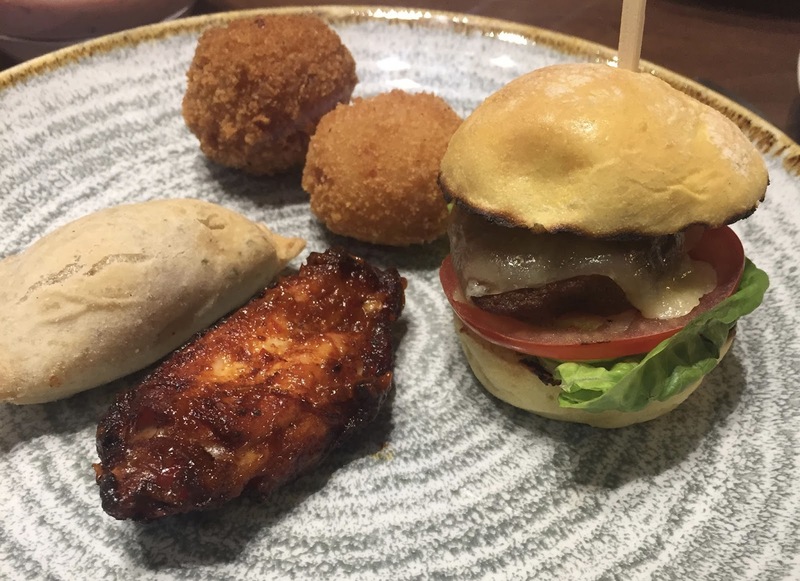 This week I was kindly invited to Hilton Garden Inn, Sunderland to try out their in house restaurant's American Afternoon Tea. The Hilton Garden Inn is only six months old and is situated right next to the Stadium of Light, Sunderland, just over Wearmouth Bridge. Having never visited the Hilton Garden Inn before (or noticed it really-it's quite impressive-I must've be too engulfed in match day jitters to use my eyes!!!) or Karbon Grill, the in house restaurant, I was excited to see what it had to offer. Plus I'm always looking for new food places to try out with my Mister. Coming in through the hotel's reception, I was really impressed with its interior design. It's sleek and modern, yet really welcoming and the staff were super friendly and helpful. And Krissi and I both loved the lights! We were shown to the bar area by the hotel staff, where we grabbed a drink and waited patiently for the other North East blogging ladies to arrive. Once everyone was there, we were welcomed to the hotel by a member of staff and introduced to our Afternoon Tea. We were all given some strawberry and banana milkshake to sample (it was like a smoothie and was delicious!) and offered some coffee or tea. The staff had kindly set up a table with some tea stands on it, to show us how the afternoon tea would look if we had ordered it in the restaurant. This was a great idea-a perfect opportunity for some great photographs before we tucked into our food. I've never had an American afternoon tea before; I was expecting hotdogs and waffles, but boy was I wrong! I started my evening of sampling with some gorgeous cheese and pickle bites and Buffalo chicken wings. 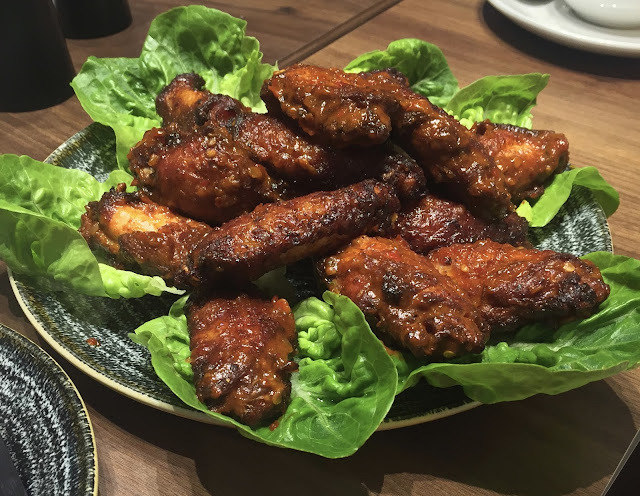 The pickle oozed out of the bites, giving a sweet and tangy kick, and the chicken wings were really spicy but delicious all the same. Next, I sample a mini calzone (I think mine was mozzarella and herbs) followed by a pork and chorizo slider, which was my favourite part of the meal. 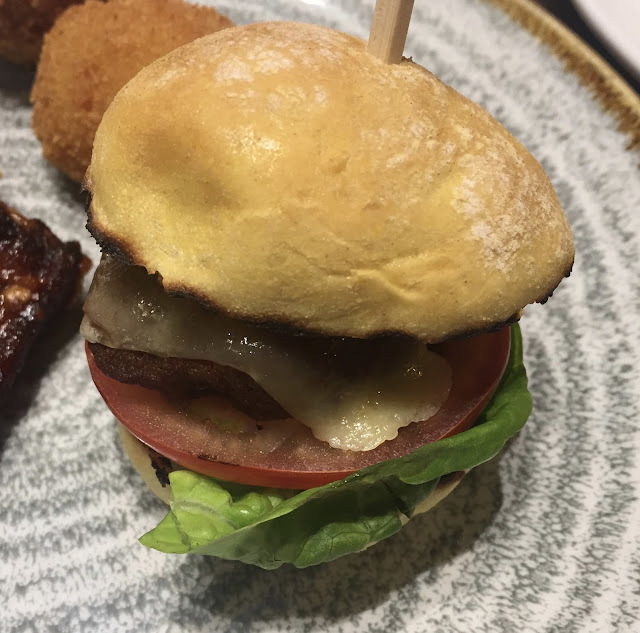 Like a mini burger, it was really tasty and melted in my mouth. 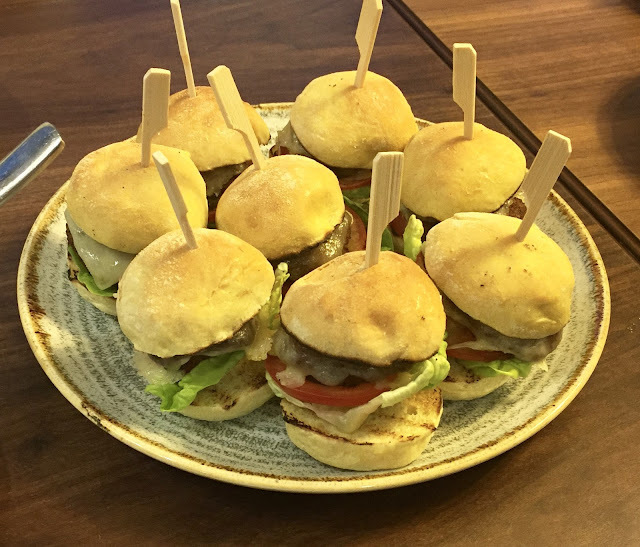 I've never seen mini burgers before; a great idea for an alternative afternoon tea. When I have any afternoon tea, it's always the cake layer I look forward to the most, and this one was no exception. 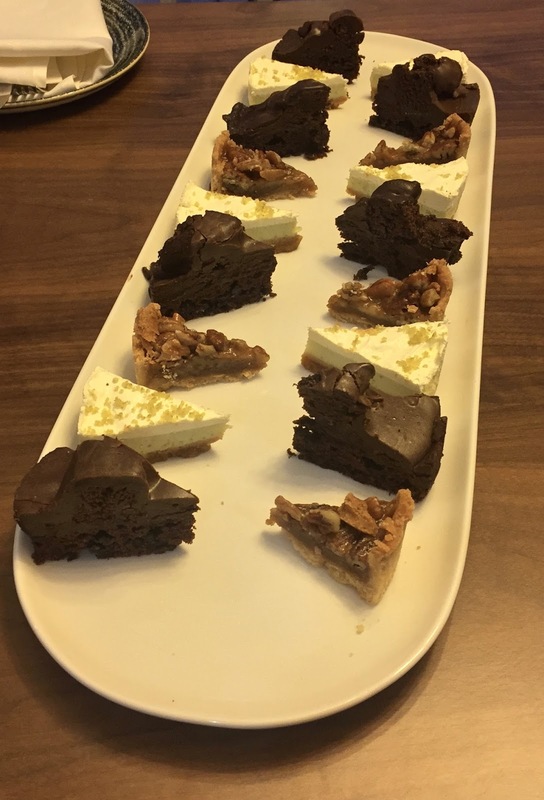 With the American afternoon tea, we were treated to Mississippi mud pie, key lime pie and pecan tart and all three looked delectable. 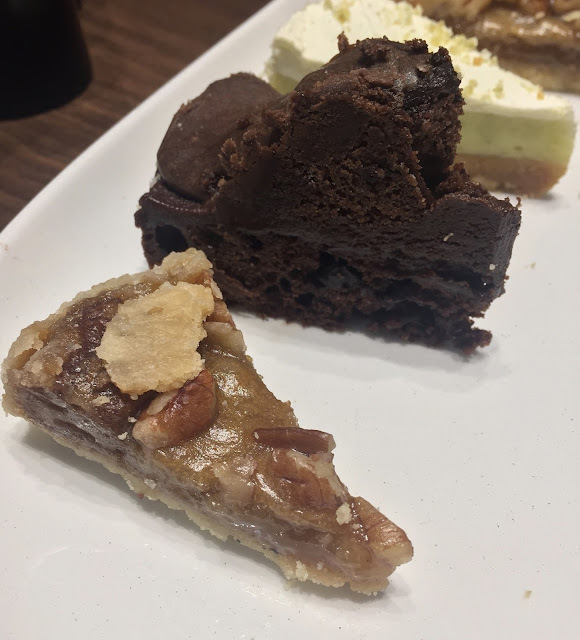 I started with the pecan tart-it was so good. Add nuts to anything and you're always onto a winner with me! The tart was the perfect consistency and melted in my mouth. Next, I went for the key lime pie-this is one of my all time favourite desserts-but I have to say I was a little disappointed with this one. The lime was a little bit too strong for my liking making the pie taste a little like perfume. However, this is just my personal taste-my Dad makes an amazing key lime pie so I think everything else just fails in comparison! However, the mud pie more than made up for it and was one of the best I've ever tasted! 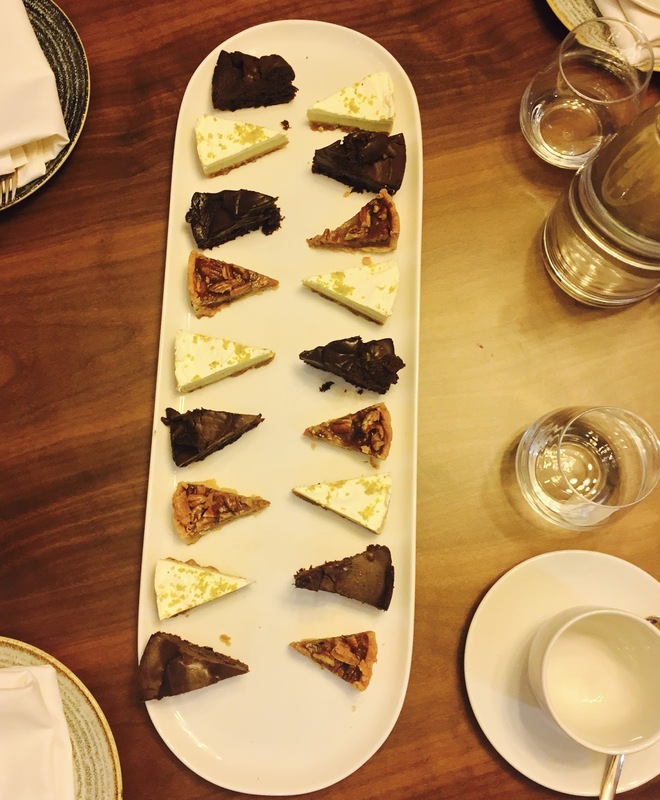 I really enjoyed trying out an alternative afternoon tea, and it was lovely to spend the evening with some lovely ladies in a really beautiful setting. The food was delicious; I'm an afternoon tea traditionalist and I love a cream scone and some good old fashioned homemade cakes and sandwiches, but I love that Karbon grill are offering something different and I think their afternoon tea would be a great option for men who might want a good feed rather than some pretty cakes. I'm sure my Mister would be really excited at the prospect of burgers and wings for afternoon tea! Karbon Grill offer a more traditional afternoon tea too; so there's definitely something for everyone. American Afternoon Tea at the Karbon Grill is £14.50 per person based on a minimum of two people sharing. Booking is recommended but not essential. You can find out more about the Karbon Grill and book your afternoon tea here. If you want to learn more about the Hilton Garden Inn, Sunderland, you can do so here. Thank you to Sorted PR and Karbon Grill for inviting me to review the Afternoon Tea free of charge; all opinions are my own. PS-make sure you take time to visit the Snowdog outside! Love the concept and the food looks great, another one for my list!